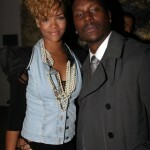 Proving her devotion to all things denim, Rihanna celebrates fellow singers Tank and Tyrese‘s “Fly & Flashy” birthday extravaganza in a McQ by Alexander McQueen Denim and Leather top. If you know more about Rihanna‘s fabulous top, by all means shoot me an email please! I am terribly interested to know more!